Let your pencil dance! 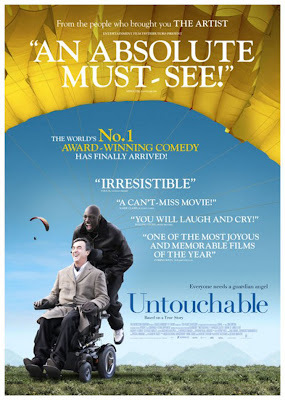 : Untouchable - the must see film of the year! Untouchable - the must see film of the year! It's not often that a film moves me to tears, or makes me almost stop breathing but that's exactly the affect 'Untouchable' had on me so I felt I had to share my thoughts on this little gem of a film with others! I quite like going to see films that I know nothing about previously.. I don't read reviews of write ups as I like to make my own informed unbiased opinion, and so, although I think I'd heard of the name of the film I knew absolutely nothing about it! In the opening scenes I thought it was possibly going to be a gangster type movie with car chases, it also surprised me that it was a French film with subtitles. It doesn't bother me but I did think it might become all deep and meaningless! For the next couple of hours though I was drawn into the world of 2 people who were so different yet they shared a friendship that is rare to find. This was interjected with laugh out loud funny moments, amazing music (70's disco... Earth Wind and Fire... my favourite!!) and moments where I just wanted to let out a big sob! Directed by Eric Toledano, Olivier Nakache and with the main characters played by Omar Sy & Francois Cluzet, it is a beautifully depicted film which to me, sums up the whole phrase 'don't judge a book by its cover'. I don't want to give too much away as I really think it has to be seen to appreciate it fully but I was lost in a little bubble for the whole duration of the film, and tears were pouring down my face by the end! You can watch an interview with the directors here. I also have to post two songs which are so very different but which I love equally. The first one here is the piano soundtrack when you needed no words, it summed up the emotions perfectly. The 2nd one is one of my all time fave disco tunes and I love it even more now.... get your boogie shoes on when listening to this!! Woohoo!! This is SUCH a feelgood film... I want to go and see it again and again... so I think I will.. and then get the DVD and watch it again and again... and get the soundtrack too!!! Like omg! I love your blog! I'm literally dying here, it's so good! Like Omg! Please could you update your blog please! OMG! I want to thank every American who participated in this election. Whether you voted for the very first time — (cheers) — or waited in line for a very long time — (cheers) — by the way, we have to fix that. (Cheers, applause.) Whether you pounded the pavement or picked up the phone — (cheers, applause) — whether you held an Obama sign or a Romney sign, you made your voice heard and you made a difference. I just spoke with Governor Romney and I congratulated him and Paul Ryan on a hard-fought campaign. (Cheers, applause.) We may have battled fiercely, but it's only because we love this country deeply and we care so strongly about its future. From George to Lenore to their son Mitt, the Romney family has chosen to give back to America through public service. And that is a legacy that we honor and applaud tonight. (Cheers, applause.) In the weeks ahead, I also look forward to sitting down with Governor Romney to talk about where we can work together to move this country forward. And my first act as a 2nd Term President is to ask our great friend and cultural icon, Naomi Austin, to update her blog. Her blog provided many hours of light relief and interest whilst pounding the campaign trail and I, the President of The United States, request that she updates her blog.